Razer BlackWidow Ultimate review: Did Razer design a better switch? Razer actually designed two types of mechanical switches, the Razer Green and the Razer Orange. The Razer Green switches in the BlackWidow Ultimate feel very similar to Cherry MX Blues. They require the same actuation force—a fairly heavy 50cN—and they exhibit the same “clicky” tactile feedback. (cN, if you’re not familiar with the term, is an abbreviation for “centinewton,” a unit of measure for force.) The Razer Greens, however, have a much higher actuation point. It’s very close to the keycap’s resting point, and its resistance fades rapidly past the actuation point. In fact, the high actuation point and initial resistance make the Razer Greens feel a bit like a clicky rubber-dome switch. Touch typists love Cherry Blues because you can learn to strike each key without ever bottoming out—your fingers recognize the actuation point and pull back. The Razer Greens’ actuation point comes so early, and its resistance beyond that is so minimal, that it’s difficult not to bottom out on every stroke. Razer designed its own keyswitches for its BlackWidow Ultimate gaming keyboard. To be fair, Razer says up-front that this keyboard is designed specifically for gaming. And for that, the BlackWidow Ultimate’s high actuation point is great. It allows you to double- or triple-tap keys quickly, much as you can with Cherry Blacks. But instead of that switch’s linear resistance, you get the the clicky, tactile feedback of a Cherry Blue. 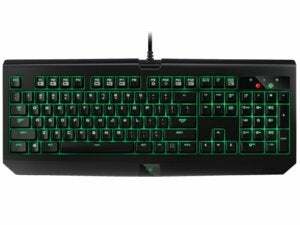 As for the rest of its design, the BlackWidow Ultimate features Razer’s standard black-and-neon-green color scheme. Keys are individually backlit, with settings that range from “off” to “pleasant, soft green” to “eye-searing, radioactive pain” (those are my characterizations, of course, not Razer’s). But hey, if you’re ever using the BlackWidow Ultimate on the surface of the sun, you’ll still be able to see its backlight. There’s a column of five macro keys on the left side of the board, which you program using Razer’s Synapse software. All settings are stored in a personal profile in the cloud instead of on-board memory. This means you must register an email address with Razer and install Razer’s Synapse software on every computer that you attach to the keyboard. I’d recommend having a second, different keyboard for typing. The top row of function keys have secondary functions, activated by holding down a second key. There are the usual media-player control keys, a Game Mode key, a key for on-the-fly macro recording, one for adjusting backlight brightness, and one to put your computer into sleep mode. The keycap that activates these secondary functions is not backlit. Because it’s the only key that isn’t, however, it’s relatively easy to find. One oddity: Rather than lighting up circular LEDs to inform you that something like Game Mode or Caps Lock is active, the BlackWidow Ultimate lights up icons. Caps Lock, for instance, gets a “C”, while Game Mode gets a “G” with a crosshair. Housing these icons beneath the plastic top, however, renders them blurry and difficult to see when viewed from behind the keyboard. The keyboard’s cable sheath is braided, ending in a hard-rubber joint where it connects to the keyboard. On the other end are two USB plugs and 1/8-inch cables for a headphone and mic. The keyboard itself has audio and mic jacks on its top-right side, plus one USB port. If you’re a big-time game player, the Razer BlackWidow Ultimate might be your ideal keyboard. But I’d recommend having a second, different type of keyboard for typing. Note: The BlackWidow Ultimate Stealth, which we have not reviewed, ships with Razer Orange switches. These also provide tactile feedback, but they’re silent (no click). They require the same actuation force of 45cN. Razer made waves by designing its own keyswitches, and they're great for gameplay. But you'll want to switch (no pun intended) to something else when you need to type. Indistinct, blurry icons for Caps Lock, Scroll Lock, etc.